Hopefully the second rest day provided an oasis of calm and relaxation for both riders and viewers alike. It’s time for those teams without a win to concoct a scheme a to gain one, and for the GC hopefuls to take a deep breath, dig deep and focus all their effort on one final bid for podium glory in Madrid. Buckle up and let’s enjoy one last sizzling, spicy Vuelta week. 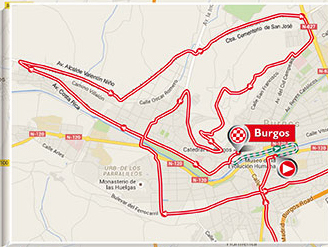 Who would have thought coming into the Vuelta’s only time trial, a 39km route around Burgos, that only one second would separate first and second positions, and that there would be less than two minutes between the red jersey and one of the best time trialists in the field. The figure-of-eight parcours is basically flat and much suited to those power men who can turn a huge gear with apparent ease. However, look at that maze of twists and turns around the city streets – it looks like a scribble and will cause problems. It will be a fascinating battle at the top and everyone – even those who don’t enjoy the noble art – will be tuning in. 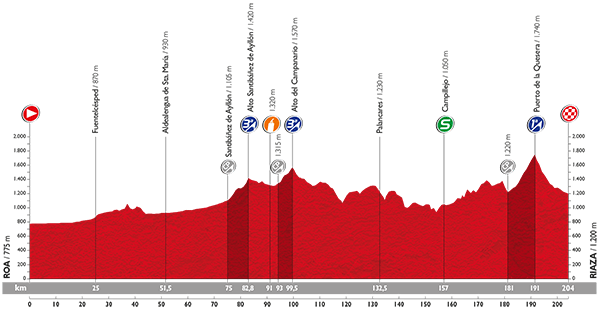 This stage sees the peloton roll out into more familiar terrain to face a long 204km route taking in more mountains. The early part of the stage is basically one long, drag uphill to the dual cat 3 peaks at the halfway mark. From then on it gets decidedly lumpy as they head towards the cat 1 Puerto de la Quesara which tops out less than 15km from the finish. Although not as steep as some they have faced in this race, 10km at an average of nearly 6% is going to hurt. From there it’s a downhill whoosh to the finish line in Riaza. With the final climb both too steep for the sprinters’ teams and not quite difficult enough to really interest the GC teams, this is the day the breakaway will probably make it. Question is, who will make the break? Another day, another stage with some climbing to do, and another where the breakaway will have its chance once more. There’s a cat 3 at about the half way mark and then a swooping descent before the 16km climb to the summit of the Alto de la Paramera. At an average of 4% it’s not really going cause any difficulties. However, the uphill ramp into the finish some 20km later is a very different matter. They start climbing with 2km to go and the last part as they head into the old walled city of Avila is not only steep but also cobbled. It will suit the punchy climbers and may cause some splits in the red jersey group where seconds may still be vital. Previous PostPodcast #72: A battle of attrition rather than aggression?